Servant/Time - Wood Palace Kitchens, Inc. The lyrics of Cyndi Lauper’s song, Time after Time ring in my ears a lot in the last few years. Time is what we have and it is so very important for our happiness when it comes to how we spend it. The world right now is full of “takers” and it seems as though this is becoming more and more true as time goes on. I think the country is ready for a change in mindset from it’s people who make up the fiber of the United States. I guess the one question I have is; Are you ready? The word servant is a great word to start with. Giving back to others is not only gratifying but also life learning. When I use the term “life learning”, it goes so much farther than just the normal education that we receive in our lives. Life learning transcends deep into our thought process and actually changes our whole meaning of life. Giving to others teaches us so much about the human spirit. With so many people down and out and the elderly with nothing much to do with their remaining life, there can be no shortage with giving back to speak of. I’m sure you can count ten people in a matter of a minute that you know that need a lift up in their life or need just a visit to make them feel special again. Just being there for someone who needs a little attention will make that persons day or week. A good friend of mine said it well the other day with how many sick elderly people there are around us that are alone, afraid and just need time from someone to complete their days. The lady in the picture is my aunt Edie. She has always been the epitome of the word servant. 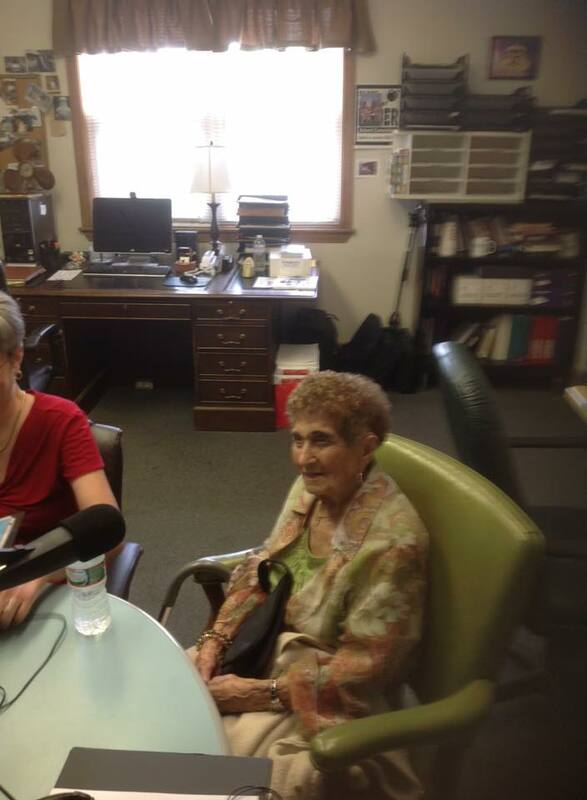 That is her on her last day of being 99 years old as my guest for my radio show, Food A Holick. Up until she broke her hip line dancing at 99 years old, this woman was gone from 8 in the morning till 8 at night. What was she doing during that time? She was out visiting and helping others whether it was doing their laundry, cooking, cleaning or weeding their garden beds around their home if they were sick.She was also making spaghetti or her famous cupcakes. she would be visiting those that were in the hospital or nursing home. She could be on a local senior citizen trip or on some excursion many states away. She would fly to another state if she knew you were ill or just lonely to see her. My dad died at 48 years old and Edie always made it a point to come over my mom’s house every Friday till my mother died 4 years ago to make sure my mother wasn’t lonely. Time was never a factor because she made the time for everyone. Her time was always your time if needed. Throughout all of this she remained grateful for everything including the people in her life. When she was down and out which happened quite a few times in the last 3 years and you would give back to her and go visit, she would tell you that you are too busy to be visiting her. Bring some homemade food to her and she said you did too much for her. She very seldom complained about her situation other than she wished she was home. She would be there telling stories from long ago which included exact dates and names. Never once forgetting a detail. She is a remarkable woman and lives every day to the fullest whether just being happy or eating her favorite food. When I say this woman can eat, I mean she can eat. Aunt Edie turned 102 this past month on August 24TH recovering at Life Care in West Bridgewater. She is the hit of the place if not maybe the queen. Most roommates can’t believe her age and I am known to tease her by asking each roommate if they could believe she was 162. Many laughs came from that kind of joking with Edie. Years ago she would tell us the story of how big Paul Anachi’s zucchini was. To this day I don’t think she knew why we would laugh and joke about that. Then there would be the nights at our company Christmas party where she would have a drink or two and be the life of the party. I’ve always tried to give back to the woman who point blank is the biggest giver I know. Whether it was cooking for her at our house, taking her and my mother out to eat or just being there when she was down and out. I would never come close to ever being close or even with her with what she has done for me or what she means to me and the rest of the family. Edie is good people and will always bring a smile to my face whether seeing her or thinking about her. We could all learn from this woman of kindness and fun. Maybe we should take the pole and carry it on in our own lives, mimicking her and her ways. This past Monday at 9:30 AM, Aunt Edie left this world to go to her next one. At 102 and 21 days, she is with God now and the heavens got brighter this week. She said she was ready for God and whenever he decided to take her. I could never describe what this woman meant to everyone that came in contact with her. She was a peach and a wonderful human being that always brought sunshine to your day. I could never say goodbye to this woman, only the words of till we meet again. God bless you Edith Dimeo Shepard! Life will never, ever be the same without you!! God speed my dear lady!! It was a helluva ride! This entry was posted in Inspiration on September 17, 2015 by THblog.